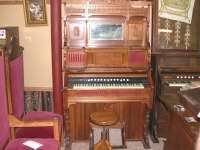 Description A Kimball Parlor Organ which was purchased by Mr J. O. Bare for his family. It has been in the Bare family since that date in 1903. It has been completely reconditioned and is in excellent condition. Should be considered Mint Condition. Has a mirror in the hood and red felt behind the cut out work. The Piano Stool which is the old fashioned Swivel type stool.